Self-contained portability. 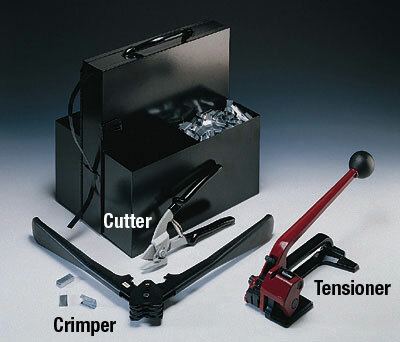 Roomy compartments hold the heavy-duty tools and materials needed to strap palletized loads including a tensioner, crimper, 500 open seals, strap cutter, and 200' of American-made steel strapping. Kit measures 9-1/2"W x 12"D x 12"H. Paperboard and plastic edge protectors are available for extra pallet support. Watch the video below to see how to use steel strapping, seals and tools.